I sure wish I were as good at my own life as I am at other people’s. I am not kidding. I am terrific at other people’s lives. Most of us are, at the very least, better at other people’s lives than we are at our own, and for the simplest of reasons. We are not those people and would never make the dumb-$*#t choices they do. It’s another thing, though, to be genuinely terrific at other people’s lives. I am. Sometimes that means telling you what I think is your best course of action; sometimes it means referring you to someone better able to determine that. Part of being terrific at other peoples’ lives includes knowing when you don’t have anything helpful to offer. It’s something I learned at the job I did – and loved – for 10 years. People at the lowest point in their adult lives would find their way to my office. My role was to help them figure out what to do next. Kind of like a low-income life coach. Lately, I could use someone like me. Life is ticking along pretty steadily, but change is afoot. My first instinct – go all “Chicken Little,” running in circles and screaming about the sky falling – is not helpful. My next – getting Prince Charming to present me with a winning Powerball ticket – isn’t realistic. My more sensible side reassures me that all will be well, and that’s the one I’m going to listen to. I’m also choosing to start taking some of my own advice. To do both those things (stay sensible, seek wisdom), I need to make sure there are plenty of other people who are also terrific at other people’s lives. For that reason, and because I know I’m not the only one who needs a dose of wisdom from time to time, I have decided to share my recipe. Have the person tell you their problem(s) and listen through to what he/she/ze is saying. Look past words when appropriate. Observe the ease or discomfort expressed as h/s/z shares whatever it is that’s on his/her/zis mind. Ask a bunch of questions about what you hear. Make sure you understand as precisely as possible what the issue(s) is (are). Also, you may need to ask questions that appear unrelated, because it’s really important to place the immediate situation into the larger context of the person’s life. Note: This process can look and feel random, weird and annoying. Get comfortable with that, because it’s okay in order to serve your higher purpose. There’s nothing wrong with erring on the side of precision, particularly in the service of dispensing wisdom. After getting as much information as you think you need, filter your answers through everything you know, based on real-time experiences and everything you’ve ever read or heard anywhere. Then, give your listener a range of options that he/she/ze is free to use or not as h/s/z sees fit. I’m lucky. I know a lot of wise and decent people. I’m reaching out to some of them as I explore options. I’m also putting all the things I’ve learned prior to work on my behalf. Yesterday, as I walked from a restaurant (sushi to take to Mom at the nursing home) to the hardware store (a light bulb for her bedside lamp), I followed my heart and stepped into a vintage store. The last thing I need is more stuff, so my plan was just to look around and enjoy. Which I did, peering at the spines of the old books and rifling through one featuring old photographs of Lexington and Concord. Then, I glanced up at a high shelf and saw something I actually needed. And, tucked into the back of a two-tiered coffee table, something I could have resisted, but opted not to. 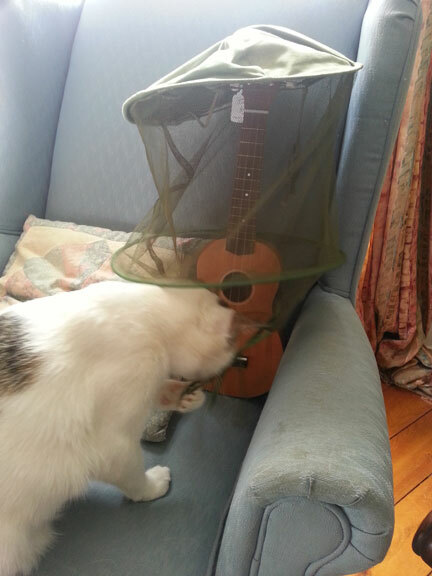 Which is why my current life changes now include a $20 vintage bee veil and a $10 ukulele.